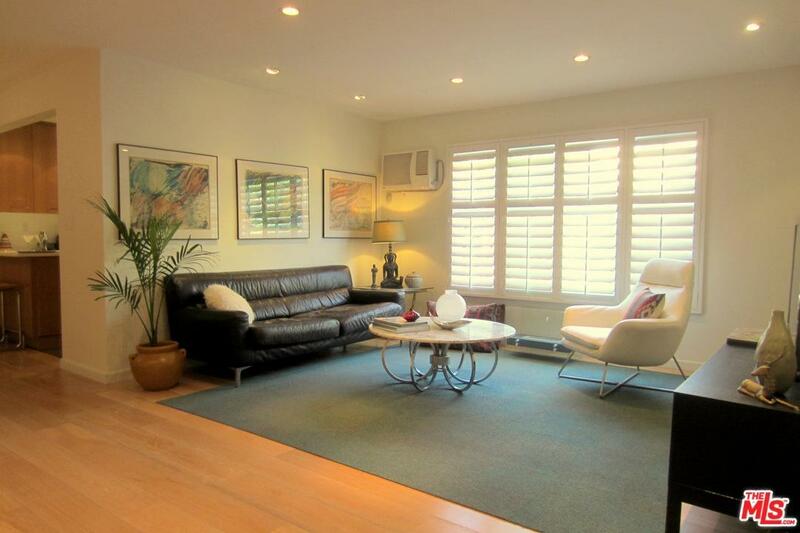 Sharp and sophisticated contemporary 1BR/1BA condo in West Hollywood's prime "Design District." Natural light just pours into this spacious and remodeled 2nd floor unit which features a hip open floor plan and White Oak hardwood floors throughout. The perfectly appointed kitchen shines with white Corian countertop, Limestone flooring, custom quarter sawn Oak cabinetry, breakfast bar and dining area. The luxurious, spa-inspired marble-tiled bath features tub, separate walk-in rain shower and custom walnut cabinetry. Other special features include dual pane windows, plantation shutters, recessed lighting, a/c, combo washer/dryer, garage parking and extra storage. This small, 26 unit mid-century complex also offers a heated community pool & BBQ patio. And it's all on a beautiful tree-lined street, just a stone's throw from the vibrant Urth Caffe, Melrose Ave, Santa Monica Blvd and all the fun shops, restaurants and nightlife that West Hollywood has to offer. Urban living at its best.